An clash on the 8 vs. 9 line of the 2019 NCAA Tournament bracket tips off at 12:40 p.m. ET on Friday as the No. 8 Ole Miss Rebels take on the No. 9 Oklahoma Sooners in Columbia. Both overachieved compared to their preseason predictions, but the Rebels (20-12) and Sooners (19-13) used different styles to get to the same place. Vegas lists the Rebels as one-point favorites, while the over-under for total points is 142.5 in the latest Oklahoma vs. Ole Miss odds. 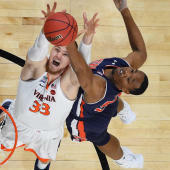 Each team is 13-3 against the spread in its last 16 non-conference games, so before you make any Oklahoma vs. Mississippi picks of your own, you'll want to consult the 2019 NCAA Tournament predictions from SportsLine's advanced computer model. This model, which simulates every game 10,000 times, has raked in the winnings for those following its picks. Over the past two years, the SportsLine Projection Model has returned over $4,000 to $100 players on its top-rated college basketball picks. It also entered the postseason on a strong 11-5 run on all top-rated college basketball picks. Anyone who has followed it is way up. Now it has analyzed all relevant data and crunched the numbers for Oklahoma vs. Ole Miss. We can tell you it's leaning over, but it also has a strong point-spread pick that cashes in nearly 60 percent of simulations. That pick is only available at SportsLine. The model knows Ole Miss was predicted to finish dead-last in the SEC in coach Kermit Davis' first year. Instead, the Rebels tied for sixth at 10-8 and Davis was named the conference's Coach of the Year. Tournament success is often predicated by strong guard play, which puts Ole Miss in a strong spot. The duo of 6-2 junior Breein Tyree (19.1 points per game) and 6-4 senior Terence Davis (15.5) made up the SEC's highest-scoring teammates. If the game comes down to free-throw shooting -- and it might in a game with a one-point spread -- Ole Miss has a clear advantage. The Rebels ranked fifth nationally at 78.3 percent, while the Sooners are 235th at 69.1. But just because the Rebels are the higher seed with dynamic guards doesn't mean they can cover the Oklahoma vs. Ole Miss spread. Experience is on Oklahoma's side, which was the oldest team in the Big 12 and among the most veteran nationally. Four seniors, including leading scorer Christian James (14.4 points per game), played on Oklahoma's 2016 Final Four team. Plus there are two grad transfers, the No. 4 and No. 5 scorers on the team in Aaron Calixte (7.0, from Maine) and Miles Reynolds (6.8, from Pacific). In an offense-first conference, the Sooners were led by their defensive prowess. Oklahoma held opponents to 40.2 percent shooting from the field, lowest in the Big 12. Controlling the glass has been a key to success for the Sooners, who are 13-1 when out-rebounding their opponents. Who wins Ole Miss vs. Oklahoma? And which side of the spread hits in nearly 60 percent of simulations? Visit SportsLine now to find out which side of the Mississippi vs. Oklahoma spread you need to jump on, all from the model that has crushed college hoops, and find out.